I wrote about what PVI is a few weeks ago, and last week explained my totally proprietary and not at all derivative version that I quite creatively call hPVI. 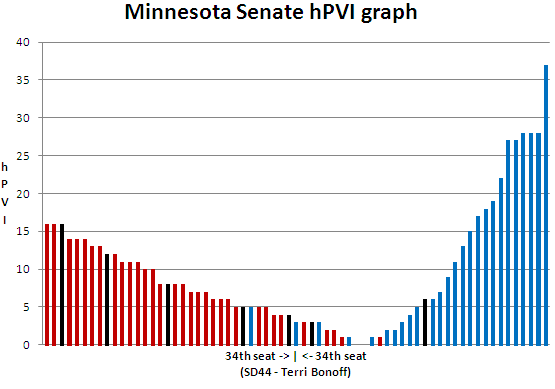 In this very post that you are now currently reading I will reveal the actual, real, live, in the flesh, hPVI numbers… for the Minnesota Senate districts. What about numbers for the house? If you’re familiar with the pace at which this series has been going then you already know that the house numbers will be posted next week. If you’re not familiar with the pace at which this series has been going then check back early and often for the house numbers which I’ll post sometime in the near future! This graph illustrates the hPVI distribution of the Senate districts, from the most conservative, starting on the left to the most liberal on the right. Bars that are red represent districts currently occupied by a Republican (in theory), bars colored blue represent districts currently occupied by a DFLer (also in theory). Bars that are black are not occupied by anyone (the result of redistricting and no incumbent being within the confines of a new district). On the bottom is a vertical bar labeled 34th seat. This represents the 34th most Republican and/or the 34th most Democratic seat, the proverbial “tipping point seat.” For this cycle that seat is Senate district 44, represented in the Senate by Terri Bonoff. What you notice right away, and what is the persistent case for Minnesota, is the uneven distribution of voters. In short, conservatives have spread themselves out into many districts, while liberals have concentrated themselves into fewer districts. The result is that the median district, Senate district 44, is three points more Republican than the state as a whole. 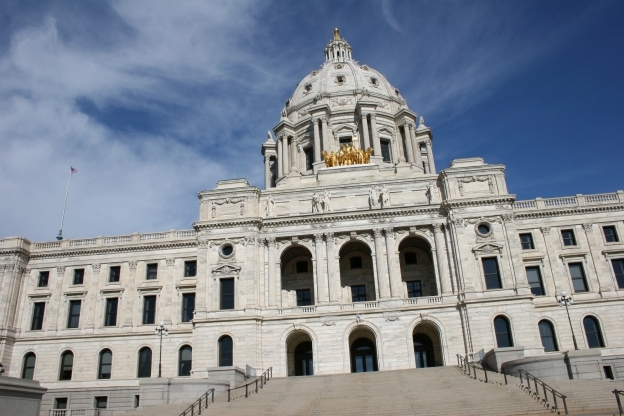 There are currently four DFL Senators in nominally Republican districts; Rod Skoe (SD2 R+5), Terri Bonoff (SD44 R+3), LeRoy Stumpf (SD1 R+3) and Katie Sieben (SD54 R+1). There is one Republican who is currently in a nominally Democratic district and that’s Jeremy Miller (SD28 D+1). There are two seats that are even, SD’s 5 and 42 and both of them I am classifying as vacant (42 has no incumbent, 5 has two of them).